The Knights of McQuaid Jesuit are not here to receive a diploma. They are here to become a particular type of man — a McQuaid Jesuit man. To achieve this mission, we strive to graduate young men who embody what we call the “Graduate at Graduation:” young men who are intellectually competent, open to growth, religious, loving, and committed to doing justice in their communities and our world. 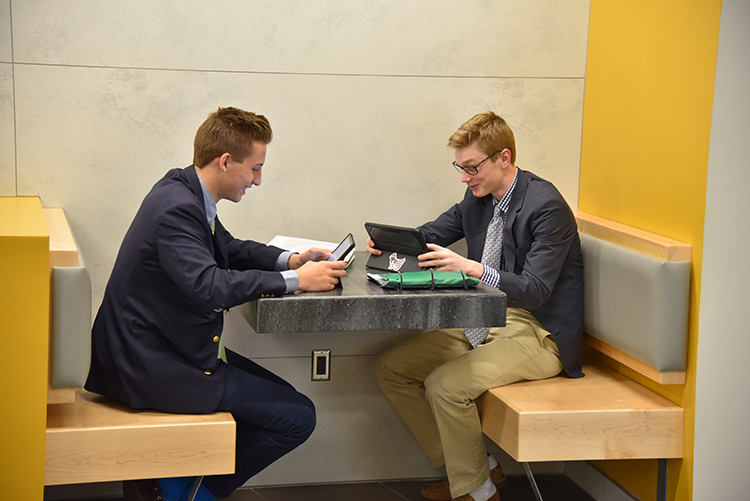 By cultivating intellectual competence in a McQuaid Jesuit man, he not only is grounded in the traditional academic disciplines and the pursuit of excellence in them, but also an intrinsic, lifelong desire to learn and understand the world around him. He develops the ability to learn in a variety of settings and through a variety of approaches. He learns to appreciate the value of teamwork and collaboration in problem solving. And, importantly for our digital age, he learns to more comfortably navigate and critically assess the tremendous amounts of information and perspectives available to him. By encouraging a McQuaid Jesuit man to be open to growth, he takes responsibility for his own development, identifying his talents and his limitations and accepting both with humility. He seeks new experiences that help him learn about his potential. He is open to hearing and understanding others’ points of view, and he is developing a curiosity about why people may differ about important topics. Perhaps most importantly, he is emerging as a leader in some way, whether by his outward actions or by his quiet example. In forming a McQuaid Jesuit man to be religious, he nurtures and deepens a faith life, examining his own beliefs and feelings in the context of a supportive community. We are proudly Catholic, and everything we do is rooted in the Gospel message of Jesus Christ. We also are proudly Jesuit, and what we do is enlivened by the central message of St. Ignatius Loyola, the founder of the Jesuits: that the goal of our life is to live with God forever, and that God can be found in all things. No matter his own faith background, a McQuaid Jesuit man is invited to experience this through prayer, reflection, on a retreat, through liturgy, and in community. In challenging a McQuaid Jesuit man to be loving, he moves beyond self-centeredness in his relationships, and seeks to deepen those relationships. He focuses not just on his own achievement, but on his contribution to the world around him. He matures in his relationships, is increasingly empathetic, experiences the care of another, and has offered similar care in response. It is impossible to spend much time at our school without hearing about the special brotherhood that develops amongst our young men. Finally, by eliciting a McQuaid Jesuit man’s commitment to doing justice, he develops the desire to meet the needs of local, national, and global communities in a world where too many of our brothers and sisters remain on the margins. Through his studies, experiences, and reflections, he begins to understand the complex roots of injustice. When he assumes the leadership role for which we prepare him, a McQuaid Jesuit man will remember those less fortunate. This is the type of man we seek to form, a particular type of man — the McQuaid Jesuit man. I invite you to explore our website to learn more about how this happens, and about the many things that make our school a special place for so many.